** Student fee : Students include bachelor, master and PhD student level. Please unload a photocopy of your student ID during the registration. For Student Member, you also need your 8 digit membership number to register. – One full registration is needed to present one paper (for oral or poster presentation). A student registration is not a full registration. -The standard page limit for each paper is 6 pages, 100 Euro/extra page charge will apply for pages up to 8 pages. • Register the co-author with one full registration (suggested option). • Register the author with one full registration and pay 365€ for the extra paper. – For the third accepted paper, please contact the General Chair (iv2019@clq-group.com) by explaining the reasons. Your request will be discussed by the committees. Registration before conference: all registration need to be paid by credit card or by wire transfer before conference. Credit card payment uses the online payment system (Master Card, Visa, Visa Electron accepted). Wire transfer payment needs to be realized within 15days and clearly mentioned the name of attendee or the reference number. It is accepted until May 10th, 2019. After this date, only credit card payment will be accepted. To download a copy of our bank account detail, please click here. Onsite registration: credit card payment and cash payment (euro) will be accepted. 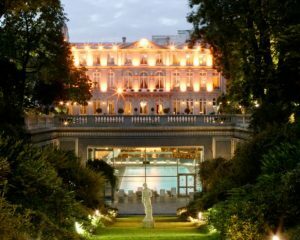 In order to celebrate the 30th annirversary of the IEEE Intelligent Vehicles Symposium, the conference banquet (cocktail dinner) will be held on Tuesday, June 11th at Cercle de l’Union Interalliée which is a club exclusively reserved. It will be a valuable networking chance for every participant.